Sugar Water for Infants! Is it Safe? 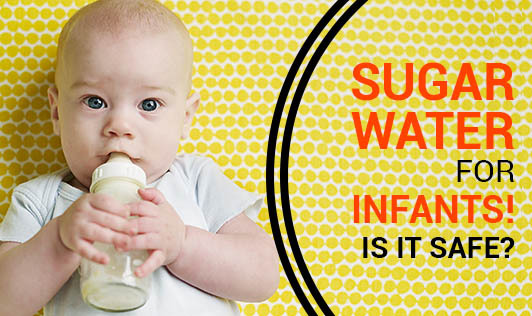 Some infants are fed sugar water for different reasons. Some give it to soothe their crying babies while some parents feel it will cure their infant's constipation. In certain parts of India, sugar water is given to babies as their first food, immediately after birth. According to the Ministry of Health, no food substitute is as nutritious as Mother's milk to the baby. Paediatricians say that, infants don't need sugar water and if it is introduced in between feeds, it disturbs the feeding routine of the baby. Sugar water affects the baby's appetite and it will reduce the intake of the mother's nutritious milk, as sugar water fills up a baby's stomach easily. Apart from this, it also affects the mother's milk supply. The more the mother feeds the baby, the more the body secretes milk for the baby. In certain conditions like diarrhoea, when the baby needs more fluids, ORS or electrolyte solution is recommended to restore the sodium balance in the baby's body. A visit to your paediatrician is more appropriate for the diagnosis of the condition. Your doctor might also suggest you to feed your baby more often. And if your infant is more than six months old, feeding him water in between feeds would help restore the fluid balance in the baby's body. There is also a popular belief that sugar water cures constipation in babies. But, unfortunately there is no proof for this belief. As long as your baby is exclusively breastfed, it is rare that it can get constipated. Even if exclusively breastfed babies do not pass stools for a few days, it doesn't mean that they are constipated. Yes, but there are chances that formula fed babies can get constipated. Talk to your doctor if you have doubts about your baby's poop.